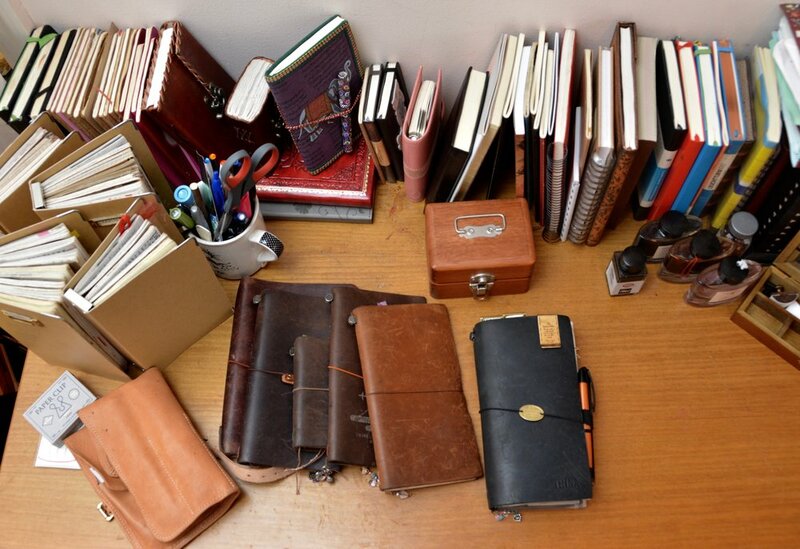 I started keeping a notebook when I was nine years old, after reading Harriet the Spy by Louise Fitzhugh. My mother purchased a marble composition notebook for me, probably from the supermarket. I recall spending recesses at school writing in it. I began by making observations about the other kids, and the teachers and nuns who taught us. Eventually, I would begin writing about, not only what I was observing outwardly, but what I was feeling inside. The latter took far more courage. I remember worrying that my secrets and deepest thoughts would be discovered. So, rather than trying to hide them, I'd keep them with me, embedded in the same notebooks with my observations, and doodles and lists and magazine clippings. I suspect that no one suspected a thing. I was much like a spy, of sorts. My choice of notebooks since then has always been intensely personal. Sometimes they are gifts, but most often they are representative of some shift in my life. Some stick around until they are completed, if they are bound, or in tatters, if they are refillable covers. Other times, a shift will come, prompting the entry of a new notebook into my life. Many of my old notebooks, for personal reasons, have been destroyed. At times, I regret letting them go, but I have to be okay with that which I cannot change. I'm not sure if I will let the remaining ones go. Perhaps, the Smithsonian will want them one day. You never know. For me, the tools that I use mean something to me. Sometimes it's because of their utility. Sometimes it's because of their utility and joint aesthetic appeal. Rarely, do I want or keep an item just because it's pretty. My notebook is a tool that enables me to write my thoughts. The experience is the important thing. But you do YOU. Find the notebook that speaks to you and write in it.